Looe Key Reef: Looe Key Reef is the easternmost of several named Holocene shelf-edge reefs in the Tile 6 sector (Figs. 86C, 87A, 87B). The former Looe Key National Marine Sanctuary (Fig. 86C) contains what has been informally known as a 'core' area (Fig. 88, dotted lines mark approximate boundary) in the center of the Looe Key Sanctuary (e.g., Lidz et al., 1985; Bohnsack et al., 2003). The core area includes the shallow reef, its backreef flat, and part of the sand and sea grass that lie within the coral rubble 'horns.' The FKNMS has designated the core area as a Sanctuary Preservation Area. A small area in the northeast corner of the Looe Key Sanctuary is a Research Only Area. The rest of the area within the Looe Key Sanctuary is now an Existing Management Area (see Marine Sanctuaries). In 1983, NOAA funded a concentrated, quantitative resource inventory in the Looe Key NMS, conducted in cooperation with the University of Miami, the USGS, and the Florida Department of Natural Resources (Bohnsack et al., 2003). Studies included descriptions of general habitat types, coral abundance and distribution, growth history of Montastrea annularis, reef fish abundance and distribution, and status of selected resources. The USGS contribution to the inventory was geologically oriented. Core transects and seismic surveys were used to map subsurface geology and Holocene sediment thickness and distribution (Shinn et al., 1989a). Sedimentary petrology was used to determine primary constituent grains (Lidz et al., 1985). Analyses of the 1983 sediments showed that a definitive correlation existed between high percentages of coral grains in the sand and high percentages of dead corals observed in the field. Coral grains thus became established as bioindicators of general health or malaise of a reef system (Lidz et al., 1985). This petrologic finding was subsequently confirmed elsewhere. Similar results were found in Belize (Aronson and Precht, 1997, 2001), in Jamaica (Precht and Aronson, 1997), and throughout the Florida Keys (Figs. 59, 61, 62, 63, 66; Lidz and Hallock, 2000). Several geologically distinctive features either not present or currently not recognized elsewhere along the reef tract are found at Looe Key Reef (e.g., Lidz et al., 1985). Two elongate areas of storm-transported reef rubble form "horns" that surround a seagrass-flat zone of patchy sand and Thalassia testudinum landward of the reef (Figs. 87A, 88; see Benthic Ecosystems for Tile 6). The horns join at the top, giving the area behind the reef a triangular shape. Storm-derived debris fields of coral rubble behind most other reefs are elongate in shape (Figs. 33A, 33B, 48B, 75, 87B). 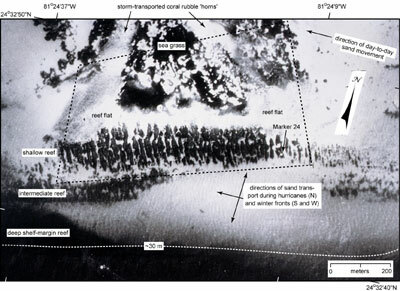 At least eight coral-rock ridges or old reef lines are clearly visible in aerial photomosaics of the outer-shelf sea floor east of Looe Key Reef (Fig. 87A). The ridges are likely present immediately beyond the western side of the reef but are less obvious until they again become more prominent (i.e., less buried) between Maryland and Pelican Shoals (Fig. 87B). Though evident in aerial photographs, the ridges are below seismic resolution (<1 m) and thus are not observed in seismic data unless the seismic line crosses a ridge capped by comparatively high-relief patch reefs (for example, Fig. 39B, line 19 in Fig. 89, and line 26 in Fig. 90; seismic tracklines shown in Fig. 91A, 91B). The seaward reef zone consists of three spur-and-groove reefs at depths of ~3 m, 7-8 m, and 15-20 m (Fig. 88; Lidz et al., 1985). The deep reef drops precipitously to a depth of 30 m and is fronted by a sand flat on the upper-slope terrace. A sand lobe composed principally of clean white sands is presently burying the intermediate and deep reefs and has covered the dropoff seaward of the center of the intermediate reef (Fig. 88). The sand lobe indicates large-scale westward and southwestward sand transport that occurs during winter storms. A core behind Looe Key Reef recovered the deepest (~15 m) mangrove peat found so far on the reef tract (Fig. 92A). Spurs and intervening grooves developed on carbonate sand and reef rubble at least 5 m thick, similar to reefs of Grecian Rocks in the upper Keys (Shinn, 1980a; Fig. 92A, 92B). The underlying bedrock surface is essentially flat and therefore did not control or influence spacing of spurs and grooves (Lidz et al., 1985). Only the thin seaward ends of the spurs are rooted on underlying bedrock. The interior of Millepora-encrusted spurs is composed primarily of Acropora palmata, a species sparse in the 1983 study and now almost non-existent as live specimens on the reef. Coring at Looe Key Reef and elsewhere in the keys led to the conclusion that most shallow spurs and grooves in the Florida-Caribbean region are constructional in origin and are not controlled by bedrock topography (Shinn et al., 1981). Bathymetry and bedrock topography show that the bulk of the Looe Key NMS occupies a shallow (0-7 m), broad (1-2 km wide) ridge between a landward trough (Hawk Channel depression, <15 m deep) and the outer-margin dropoff (to >30 m) south of Looe Key Reef (Lidz et al., 1985). Average sediment thickness in the Sanctuary is 5.7 m, whereas directly behind the reef it is 12 to 15 m. Prevailing direction of sediment transport is from east to west, parallel to the margin (Fig. 88); however, coral rubble has accumulated immediately behind the reef, and coral-rich sands have collected both landward and seaward of the reef. Based on seismic and radiocarbon-age data, the rate of sediment accumulation in the Looe Key Sanctuary is estimated to have been 1 to 2 m /1 ka during the past 7 ka. Quantitative sedimentary petrology revealed the dominant type of sand grain in the Sanctuary in 1983 was coral, followed by fragmented molluscs and Halimeda (Fig. 12; Lidz et al., 1985). In 1983, coral grains constituted 30 to 50% of the sediment. A lower percentage of Halimeda grains conformed to a trend of decreasing Halimeda sand content from north to southwest along the reef tract (Fig. 64). Because this trend was accompanied by a gradual increase in the proportion of dead and dying (relative to healthy) reefs in the same direction (Fig. 61), the trend was interpreted to reflect greater production of coral sand resulting from a marked acceleration of bioerosion of abundant dead reefs in the area (Lidz et al., 1985).